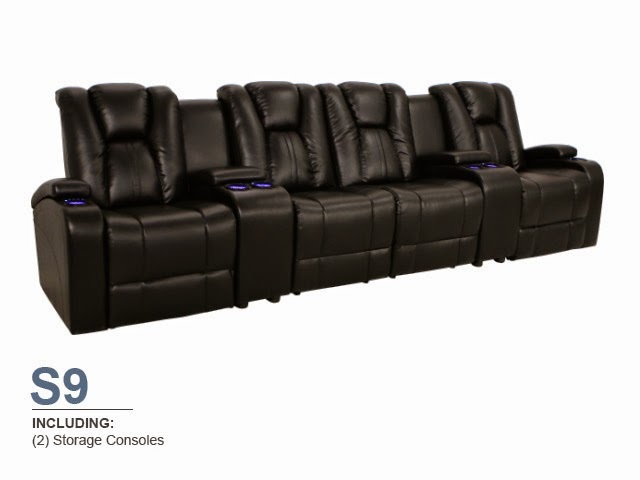 Those of you looking for the cutting edge in home theater seating development will be pleased by the addition of the Innovator Sectional to the 4seating line. 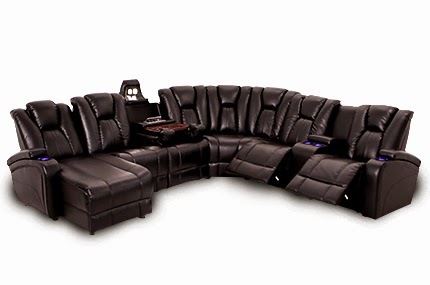 This seat offers a dizzying array of features, matched by over 45 different sectional configuration options--put simply, there's no other seat quite like it! 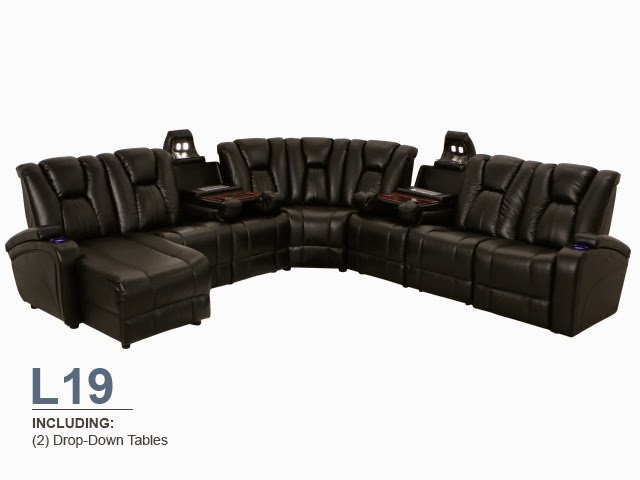 Each individual piece in the Innovator Sectional is crafted from genuine bonded leather, which is designed to carefully replicate the swank look and rich texture of full-grain leather, at an outstanding value. This material is easy to maintain; simply wipe down with a damp cloth and it will retain its polish for years to come. The seat itself is extremely comfortable, with a marvelous "sink in" feeling that wraps itself around your body for a warm, snug fit. The overall style of the Innovator is aggressively modern, with a streamlined look that boasts a slightly futuristic aesthetic. Black and coffee color options are designed to match just about any room decor. This commitment to relaxation is augmented by the seat's powered headrests, which are controlled by the simple push of a button by the lighted cup holders on the armrests. This allows you to adjust the headrest to any position whenever you want, which besides providing maximum individualized support, helps to prevent neck and shoulder strain. This pampering of the upper body is aided by a full chaiselounger, which offers a firm buttress of cushioned support to the legs and feet by eliminating the traditional gap between the seat and footrest. This power recline option is quiet, smooth, and eminently practical. If that was all there was to the Innovator, it would still be one of the most exciting and--yes--innovative seats on the market. However, that's just the beginning. This seat can be ordered with a special drop-down table fashioned from handsome burlwood, with two cup holders and ample space for the placement of trays, tablets, reading materials, and more! Above the table, the headrest flips up to reveal an overhead lighting panel that will discreetly illuminate anything you may need in the dark, or double as a handy reading light. In addition, a pop-up input plate just above the table is equipped with 2 AC adapter ports and 2 USB ports, so that you can charge tablets, cell phones, and other electronic devices for the complete expansion of your entertainment options. With the connection of a tablet to your TV, the endless possibilities of the internet lie at your disposal. As a sectional, the Innovator comes in a wide variety of both L-shape and sofa configurations. There are over 45 different L-shape designs, which feature a seating wedge that connects the two sections together. The sofa arrangements come in 12 different options, with both L-shape and sofa styles featuring configurations with full chaises. Options include two, three, and four seat sofas, seats flanked by two chaises, sofa-wedge-chaise lineups, or just about any combination of seats you can imagine. With this many options, you are certain to find the configuration that suits the space, expected capacity, and taste of your home theater. The Innovator has so many features, it's almost not enough space to put them in one blog. Lighted cup holders emit a warm azure glow that keeps your beverages secure and close at hand, while in-arm storage compartments are perfect for a quick and painless cleanup of items when the night is over. 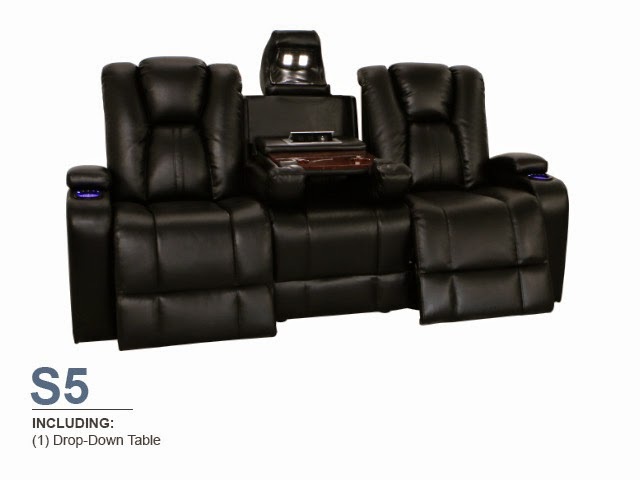 Taken together, this all-in-one extravaganza has become one of 4seating's biggest sellers, with the reasons for its continued popularity not hard to fathom.